This blog has been vacant for a couple of years, but I have officially moved my web presence to my new website and blog. Please follow me here. 34 Picture Book ideas in 30 days!! Some of them are more fleshed out than others, but I have 2 that are especially begging to be written NOW, NOW, NOW!!! I keep telling them to shush, I have a thesis to finish. But there's good news. I finished that first FULL DRAFT of the thesis tonight too!!! Woo Hoo! Double happy dance. Now, the real work begins with my thesis: revision, revision, revision. What am I going to do with the picture book ideas? 1) I'm going to write those two that I can't get out of my head. 2) I'm going to sock the other 32 away and let them simmer. You see I plan to do the Picture Book Marathon in February 2011. I need to write 26 drafts during that month. So, my ideas are simmering now. My fingers should be flying in February. 3) I also have 5 more nonfiction picture book ideas that are going to require some research. These weren't even figured into my 34 fiction picture book ideas for this month. I am going to start researching these as well. Many thanks to Tara Lazar for hosting and providing inspiration all month. I have been reading like a writer lately. In my current W.I.P., I am nearing the end. I know something horrible is coming. I know what it is. I have been dreading writing it. It will be very emotional for me. I know I need to write this part of the book, yet it's difficult. One of the questions I've been thinking about is how much tragedy can a teen reader take? An agent wanted me to consider the fact that I have tragedy at the beginning and the end of my book. My first response is--tragedy happens in real life. I want to show a character who rises up from unspeakable tragedies. This agent wasn't telling me NOT to write this book, but merely wanted me to consider was I writing two stories or one? It was a valid point. Unfortunately, multiple tragedies can happen in real life to real teens. It's horrible, but it happens. I don't want to skirt around tragedy or give my protagonist an unrealistic situation. Over the weekend, I read a YA novel with incredible emotional punch. 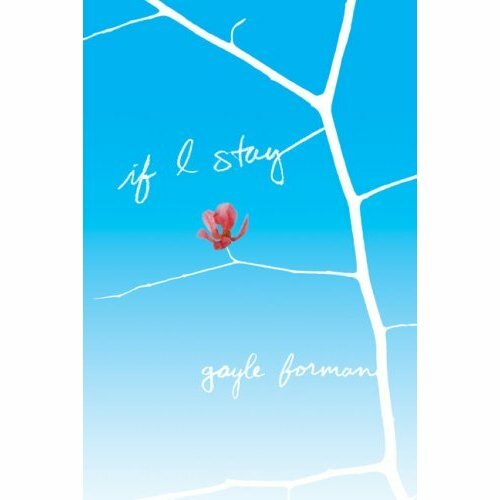 In Gayle Forman's If I Stay, Mia's family is in a car accident. She is close to death. She has to decide if she should hang on and try to live or if she should slip quietly from this earth. I don't want to give away all of the reasons she gives to stay or to die. Those heart-wrenching reasons are the very fabric of this story. It made me think of why we read in the first place. We read because we want to feel something. We may want to laugh, cry, escape, or be touched. But in all cases, we want to be moved. Forman's novel is gut-wrenching and emotional. It will make you cry. But I didn't feel teased or as though she'd played with my emotions. Mia goes through a life or death decision. She lives through something I pray I never do. When I read this book like a writer, it gave me a better understanding of how deeply I can cut to an emotional core. I don't want to taunt my readers' emotions, but I want them to feel, even if it's a tragedy. But more than anything I want them to have hope. I have been participating in PiBoIdMo. I have been faithfully coming up with a picture book idea every day. I keep thinking I'll be warmed up and ready to go when the Picture Book Marathon starts in February. The good news is that I have had lots of ideas flowing. The bad news is, I didn't sleep last night. You know, when those crazy words run through your head and you can't get them out? That's the kind of night I had. I was composing haiku last night. I'm teaching haiku to my fourth graders right now. At night, I've been writing haiku and brainstorming ideas for my own haiku book. I was so tired, but I composed a haiku about earthworms when I was half-asleep. I tapped out the syllables with my eyelids. It was great. I was too lazy to roll over and write it down in the dark. But you know how that goes.... You sometimes forget when the morning rolls around. Then sometimes, when the morning does roll around, what you wrote doesn't seem very good anyway. That darn haiku kept me up all night. I woke up four times reciting it to myself. The cool thing? I remembered it this morning. I wrote it down as soon as I woke up. Even better news? It seemed just as magical this morning as it did last night when I wrote it when my syllabic eyelids wouldn't leave me alone. Some of you may be participating in NaNoWriMo. Well, I can't even get a novel written in a year (but I'm trying). But I was really excited when I heard about the PiBoIdMo (Picture Book Idea Month) hosted by Tara Lazar. The challenge? To come up with an idea for a picture book every day for a month. Then you have 30 ideas to get you through until the next time PiBoIdMo rolls around. Last February I participated in the Picture Book Marathon, a challenge to be sure. I had to write 26 picture books in 28 days. It was tough. However, some of them are crap. But about half of them have been decent enough to revise and really work on. Worth a month's of work? You bet! The hard part of that last year was that I had to come up with ideas. I started coming up with ideas about a week in advance, but when the middle of February came, I was tired of my ideas and really needed some more. And some of those ideas needed a little bit of research. I didn't have time to do too much of that. So, as I see it, the PiBoIdMo challenge will give me time to generate the ideas. Then I have December and January to do any research needed. Then I can really write in February. Did I say I have a novel to finish? Yeah, I want that done by December 31. I've always liked a good challenge. When I attended an SCBWI event with Deborah Brodie, she talked about how writers needed to take a sabbatical from writing. She and Sarah Davies both emphasized the importance of living life to help feed your writing. So I took their advice. We went on vacation for 9 days. I unplugged for those 9 days. I took a cell phone, but used it rarely. I checked no e-mails, read no blogs, and only wrote because a character’s voice in my head wouldn’t leave me alone. When she’d kept me up for 2 nights, I finally gave in, wrote everything about her I knew so I could remember. I can’t write her story now, but I have some nuggets saved for after my current book is done. We did a plethora of things. My husband likened it to a scavenger hunt. You know, the kind where you reach a destination, hop out, get what you needed, then hop back in the car and on to the next destination. I found it relaxing and it fed my writer’s mind. Here’s a few trip highlights and how they fed the writer within. 1. Thomas Edison’s Laboratory, West Orange, NJ: This man was amazing. He had a huge laboratory and was a pioneer in so many ways. This is a picture of a fraction of his library that reminded me a bit of the one in the UVA Rotunda. I was in awe of the amount of trials and failures it took for him to invent and improve so many technologies. 2. Statue of Liberty, New York Harbor: This was my second trip to see Lady Liberty, but I took away new things this time. The first time I saw her, I was on my honeymoon. This time I was introducing her to my daughter. Bartholdi, Liberty’s designer, wanted to have her ready in time for the 100th anniversary of our country, but he was 10 years late. It didn’t stop him. He kept pursuing the dream. And then there were the thousands of people who laid eyes on Lady Liberty before coming to Ellis Island. Each one of them has their own story. 3. Plymouth, Massachusetts: Since my daughter learned about the Pilgrims and the Mayflower in kindergarten this year, we thought we’d take her to the historic site. I learned so many things and dispelled many misconceptions I had. There are always many sides to every story. It made me want to make sure I consider all angles before telling my story. 4. Whale Watching and People Watching Cape Cod, MA: Whales are beautiful creatures. I got see a dozen or so in all of their glory. These pictures just don't do them justice. I was also on a boat for four hours which gave ample opportunity to watch people. People are sometimes as fascinating as animals. 6. Dr. Seuss Sculpture Garden Springfield, MA: To have your characters immortalized into sculptures? Well, that in and of itself is inspiring. They also had some fabulous museums around these garden. I sat on the mosaic bench and took it all in. 6. Norman Rockwell Museum Stockbridge, MA: (No Pictures except for one with all of my family in it. We were rushed because we got there 40 min. before it closed). Wow! An unplanned stop, but well worth it. The paintings are even more beautiful in person. And a bonus William Steig exhibit was there too. Jeanne Steig did some whimsical sculptures when she was having writer’s block because she had to keep her hands busy doing something. They were also on display. We also got to see Rockwell’s studio. 7. Baseball Hall of Fame, Cooperstown, NY: Another unplanned stop, but truly amazing. I love baseball (the only sport I watch). So many players with big dreams, who reached their goals. It was also inspiring to learn more about the players who faced much discrimination just to pursue their passion. What did I do on my summer vacation? I left the "work" at home, and filled up my writer's cup. I went to a workshop all day today about teaching kids writing. As much as I love to write and as much as I love to teach kids how to write, I never get tired of adding another tool to my toolbox. Amanda Donnelly, of IRN, was there. We broke down the three domains (Composing, Written Expression, Usage and Mechanics) that Virginia’s students have to be able to master in their writing. We did a practice writing prompt, and I realized I haven’t mastered those domains either. Something I learned in the Writing Project many years ago: we really don’t know how much we expect of kids in their writing until we try it ourselves. Writing teachers need to write themselves. We tried a writing prompt today. It was about the happiest memory. I make a list of possible happy memories to write about. I picked my favorite, then brainstormed some more about one particular trip. All things were going well…. THEN…I began to write my rough draft. Two pages into it, I realized something dreadful. I didn’t write to the prompt at all!!! I wrote about spearing jellyfish. Yes, a morbid, graphic, fictionalized tale. It was interesting. It had roots in reality, but it was fiction. It had some figurative language. It had some vivid verbs. It even had a central idea. It just wasn’t the central idea I was supposed to write about. Author’s Share time came along. We were supposed to volunteer to share our writing. Now, we had been working on it for a whole 15 minutes. I am not a big fan of sharing writing immediately after it is written. It’s like eating bread dough before you’ve given it a chance to rise and bake. It just isn’t for eating. I was NOT getting up to share my OFF-TOPIC two page story beginning. First of all, it wasn’t a whole piece. It wasn’t on topic. And it certainly wasn’t happy. I shared among my small group, made up of people I know. They were so nice to me. They thought it was terrific. But it was off-topic. As I thought about my dilemma, I realized how common this is for kids. How dreadful to realize you really like the story you are telling, but it isn’t the one you are SUPPOSE to be telling. A lesson learned for me. I can’t change the state’s prompt. I can’t even change the fact that they will have to write to a prompt, but I CAN teach them what to do when this thing happens to them. I plan to tell them my experience, show them my writing, and brainstorm ideas with them on how to solve this problem. By the way, I don’t plan to write anymore about the happy memory because frankly happiness and perfectness make very boring stories. I am planning to keep going with this story about the jellyfish maimer and find out what he plans to do next. He’s an interesting fellow.